A recital of songs can be very serious and deeply moving, providing a catharsis for sorrow and the pain of human existence. Other times, a recital can be just plain fun. Last night's recital by Mirror Visions Ensemble at The Sheen Center had a theme that leaned toward fun. Most of the songs were about the animal kingdom but others were about humans who behave worse than animals. The three singers of Mirror Visions Ensemble are all gifted with the ability to bring a song to vivid life. Of course, the standard requirements for vocal music are necessary but once once knows a singer well (and we know these three very well), one takes for granted their vocal skills--tonality, phrasing, linguistic ability, etc.--and focuses on their ability to get a song across. And that is why MVE always draws a substantial audience. We know a good thing when we hear it! After an instrumental introduction in which pianist Margaret Kampmeier treated us to "The Cricket Marries" by Béla Bartók (the cricket is definitely NOT Bluebeard!) 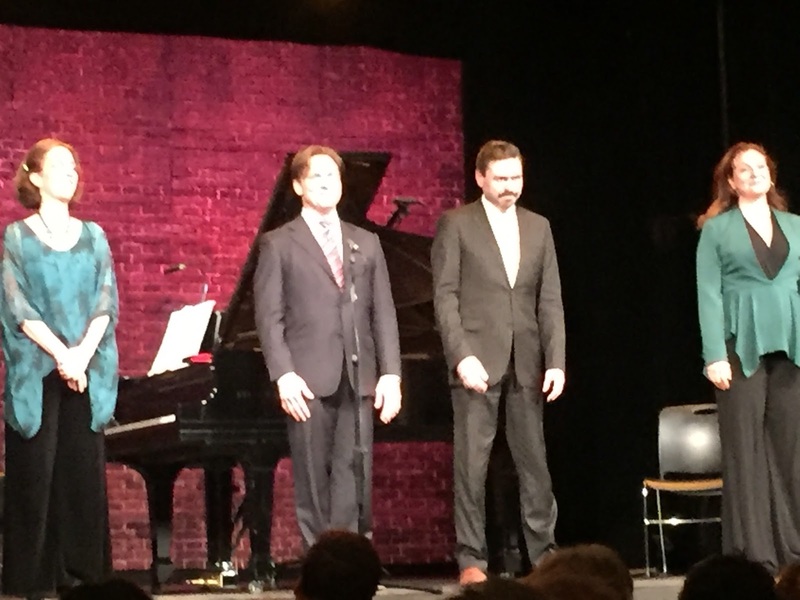 all three singers joined forces for Josquin des Prez' "El grillo" in high Renaissance polyphony. We have no idea why this Belgian composer set a Spanish text but it was definitely one of the highlights of the evening. We don't get to hear much music like this and probably wouldn't want to hear an entire evening of it! It did make a great hors d'oeuvre for the rest of the evening. Tenor Scott Murphree gave a deliciously ironic slant to Camille Saint-Saëns who wrote "La cigale et la fourmi" four centuries later. True to the mission of MVE--that of offering different settings of the same text--baritone Mischa Bouvier performed the same text, which was given a dramatically different slant by André Caplet. Maurice Ravel's delicate "Le martin-pêcheur" was sung by Mr. Murphree in true Gallic style, hushed as if not to disturb the Kingfisher perched on the poet's fishing rod. Ravel's "La pintade" is a musical portrait of a very disagreeable female (perhaps a critic, LOL) and all three singers participated in bringing her to annoying life. We don't get to hear much Hungarian but Kodály's songs "Youth is Like a Falcon" and "My Geese, My Geese" fell pleasantly on the ear since the text married well with the music. In the former, Ms. Slywotzky's voice was accompanied by some lovely rippling piano figures. In the second, Mr. Murphree sang of a woman who wants her geese to return, perhaps without her husband. We liked the way the singer showed her change of heart at the end. Joaquin Rodrigo's "Canción del cucú" was beautifully arranged for three voices by Richard Lalli, Guest Artistic Director. The text appears to have been written by Rodrigo's wife. "Son nata a lagrimar", the duet between Sesto and Cornelia from Händel's Giulio Cesare was performed by Mr. Murphree and Mr. Bouvier; it was so gorgeous that we have been listening to recordings of it all night. The "beast" in this case was Cleopatra's brother Ptolemy (Tolomeo) who beheaded Pompey -- Sesto's father and Cornelia's husband. The two join in heartfelt grief. Mr. Bouvier gave a dramatic reading of excerpts from "Ode to Napoleon Buonaparte" which was accompanied by Schoenberg's piano, a piece with which we are unfamiliar. Ms. Slyvotzky gave a highly dramatic and effective reading of Pompey's speech from Shakespeare's Antony and Cleopatra which was followed by Edith Sitwell's strange text set by William Walton. The set ended with a premiere of Scott Wheeler's "Et tu Brute Fanfare" in which all three singers took part, an MVE commission. We have less to say about the second half of the program. We adore Ogden Nash's text for its wit but Richard Pearson Thomas' music detracted from the pleasure one gets from reading or reciting these little gems, which never ever asked to be set to music! This too was commissioned by MVE. Francine Trester was inspired by Sheridan Oman's animal engravings to write a commissioned work which premiered last night but did not affect us one way or another. The next section was meant to say something about 20th c. tyrants Stalin, Franco, and Hitler. We did enjoy Shostakovich's "Fussy Mummy and Auntie" although we didn't grasp the connection with Stalin. Christopher Berg set Garcia Lorca's "Casida de las palomas oscuras" but we didn't understand what the text had to do with Franco. Similarly for Garcia Lorca's own compositions which were strangely sung with alternating verses. From Canciones Populares, we are familiar with "Las morillas de Jaén" and "Anda, Jaleo", but we failed to understand the connection. If you, dear reader, have insight into this connection, feel free to share in the comments section. We also puzzled over Hanns Eisler's selections from Hollywooder Liederbuch. Interesting but in what manner were they commenting on Hitler? We cannot say. What we can say is that Tchaikovsky wrote some lovely songs! Ms. Slyvotzky sang of "The Nightingale", with avian support from Ms. Kampmeier and the trio sang of "The Cuckoo". Mikhail Glinka was sneaked in between with "The Skylark", sung by Mr. Murphree. As encore we heard Jean Wiéner's "Le Léopard", a setting of text by Robert Desnos, translated by Mr. Lalli, and performed by all three artists. What fun!